Paris is always a good idea for many reasons, shopping is certainly one of them. In this respect, the department stores Printemps and Galeries Lafayette are the places to go and see. They are famous worldwide and show up on every travel guides in the section: shopping. They are located Boulevard Haussmann, “Rive Droite “, as we Parisians call it. Ladies (and gentlemen…), welcome to Le Bon Marché Rive gauche. The temple of luxury. “Bon marché” is an expression literally meaning good deal, inexpensive..(well, you may find out that the prices are anything but inexpensive…but that is another story…). 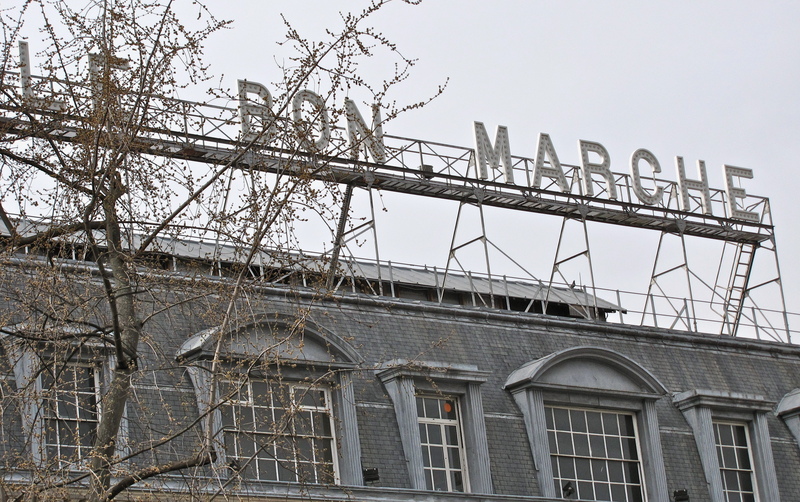 A little bit of history though, Le Bon Marché was created in 1852 by Aristide Boucicaut on the Rive Gauche of the Seine. Visionary man, he created the first department store in the world, offering a unique experience of shopping to Parisian ladies. No need to make an appointment at the seamstress which was the usual way back then, women could go there freely to touch fabrics, try on gloves, hats, ready to wear dresses and smell perfumes in the same place and buy those treasures at fixed prices …Definitely a revolutionary and modern approach to business, too, with the set up of mail orders, home delivery, sales which turned into an immediate success. Also a philanthropist, he created a pension system and medical care for the women working in his department store. If you are a lover of French literature, you may have heard (read?…. ;-)) of “Au bonheur des dames” written by the XIXth century writer Emile Zola, a novel taking place at Le Bon Marché whose BBC series “The Paradise” is based upon..
Hope you enjoy this little teaser.